U.S. Veteran Eric Harshman discovered a passion for turf while helping out at his in-laws' golf course. 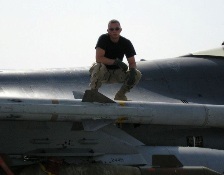 The seeds of Eric Harshman’s second career took root during his 12-year enlistment in the Indiana Air National Guard. That's when he began helping out at his in-laws' golf course, and discovered a passion for turf. Harshman joined the Indiana Air National Guard right out of high school so his parents wouldn't be saddled with paying for his college (he earned a bachelor's degree in marketing and graphic design). When Harshman's tours ended, his commanding officers granted him time to attend the Rutgers Professional Golf Turf Management School in the fall of 2007. The intensive certificate course involves two 10-week classroom sessions during the off-season, with an internship in between. There are two sessions a year, one in the fall and another in winter. While the program is known for producing skilled golf course superintendents, many graduates go on to maintain professional and collegiate athletic fields, parks, and the grounds of corporations and universities. "The program is geared for golf, but everything you learn – about soil, grasses, insects and diseases – can be applied to any turf management," said Fran Koppell, the Turf School's senior program coordinator. Eric used his GI Bill education benefits to attend the non-credit job training program. The turf school is among more than 300 programs offered by the Rutgers Office of Continuing Professional Education (OCPE) that help U.S. veterans take the next step. "We appreciate the sacrifices our military men and women make for us and we are proud to be able to give back to veterans by providing them the education they need to advance their second careers," said Edward V. Lipman, Jr., former director of the OCPE. In its 52nd year, the Rutgers Professional Golf Turf Management School has more than 2,300 alumni, including 550 who keep in touch through the Rutgers Turf Alumni page on Facebook, Koppell said. Though stationed at an Air Force base in Fort Wayne, IN, Harshman chose Rutgers' program because of its reputation. "In this industry, networking is huge and Rutgers attracts people from all across the country," he said. "When I have a question, I have a huge list of people I can reach out to." The veteran did his internship at the Cincinnati Reds' Triple-A baseball stadium in Louisville, KY, and was hired as assistant sports turf manager when he graduated in 2008. In June 2011, the same month his military service ended, Harshman became the assistant sports turf manager at Louisiana State University, where he managed 5-6 student employees and multiple fields. Thanks to contacts he made back in Louisville, Harshman landed an assistant sports turf manager position at the University of Kentucky in July 2013. Along with his personal connections, he credits his knowledge of the South Eastern Conference and collegiate sports procedures for helping him secure his current job. But his education at the Rutgers Golf Turf School was a major factor in preparing him, since the difference between golf turf management and sports turf management is negligible. "All the science is the same," Harshman said. "The major difference is the height at which the grass is mowed." Although the Rutgers internship put baseball in his blood and he hopes some day to work at a major league stadium, he loves what he does now. 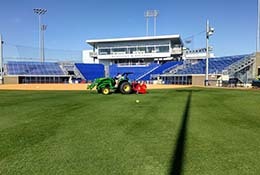 At the University of Kentucky, Harshman oversees 3 full-time staff and 12-14 student employees, maintaining the soccer fields and softball stadium. He loves the variety of his job, dealing with multiple sports and interacting with different coaching staff members. But one of his favorite aspects is the high level of responsibility. "My supervisor has given me free rein to spread my wings and do what I see fit as far as maintenance practices and scheduling staff," Harshman said. "I'm not the head guy, I don't have that title, but I have ownership over what I do here. That’s a great feeling." Interested in learning more? Explore our Professional Golf Turf Management School programs. For veterans, get the inside scoop on using your GI Bill benefits to take non-credit training courses at Rutgers. "We appreciate the sacrifices our military men and women make for us and we are proud to be able to give back to veterans by providing them the education they need to advance their second careers." Harshman's education at Rutgers prepared him well for an assistant sports turf manager position at University of Kentucky.